Home Costs > How Much Does an Epoxy Garage Floor Coating Cost? How Much Does an Epoxy Garage Floor Coating Cost? 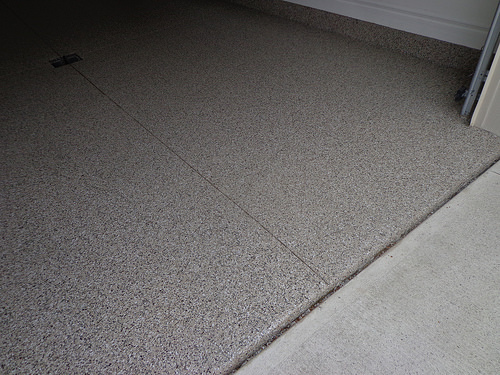 An epoxy garage floor coating is a cost-efficient way to increase the look of a concrete garage floor. Once a garage floor is coated, it will hide tire marks and any imperfections that you may have seen before. With many colors and designs to choose from, it can change your garage floor from a dull gray to something extraordinary. How much does a garage floor coating cost? The cost of a garage floor coating will depend on the size of the garage floor, the type of epoxy being used, the number of coats required, the contractor doing the work and the geographical location. To use a professional, plan on spending anywhere from as little as $3 to more than $10 per square foot. The typical two car garage, from what we had researched, will cost about $2,000 to $3,000. Since so many jobs will be unique, we highly consider using the free contractor quote tool at HomeAdvisor.com. Here, you simply explain your job and multiple licensed contractors can contact you with exact bids. On MetaFilter.com, a forum member asked what it should cost, and he stated he was quoted $2,500 a two car garage that measured 550 square feet. A do-it-yourself kit, if you were to want to do it on your own, would cost anywhere from $50 to more than $500, again, depending on the type of epoxy you want, the number of square feet the epoxy can cover, the tools included in the kid and how many coats you will need. These kits are relatively straightforward and can be found online, at your local hardware store or even paint store. These packages will come with almost all the materials needed to complete the job and detailed instructions. Before your garage floor is even coated, there is usually an in-home consultation where a contractor will meet with you, explore your options and measure your floor for an estimate. Depending on the contractor you use, this in-home visit may be free, while others will charge you but apply the costs toward the job if you were to use them. There two types of epoxy coatings owners can choose from: either a solid or water-based. A solid epoxy coating can last more than 20 years and will be able to handle high traffic and chemical exposure, whereas a water-based epoxy will act like a primer, but it won’t be as durable as a solid coating. Even though its glossy finish can protect the concrete from stains and chemicals, it will need to be reapplied a lot more than its solid counterpart. Coatings can virtually come in any colors; however, most owners prefer to stick the popular white, gray or clear color options. Before the epoxy coating is applied, a professional will first check for any moisture, and if any is present, the epoxy can’t be used. Depending on the size of your garage and the condition it’s in, it can take anywhere from one to as many as eight coats to see desirable results. A typical application may include the base coat, followed by a few epoxy coats and a broadcast coat that may have colored sand and/or flakes inside. The first step involves patching, filling and leveling any troubled areas. Next, the concrete will be pressured washed and left to dry overnight. Once dry, if using a professional, a grinder or shot blaster will be sued to remove any previous coatings and to help open up the concrete surface. Next, the epoxy paint will be mixed and applied immediately, followed by sprinkling any colored flakes or substances if desired. In the event that your garage is not empty yet, you may need to pay the installer an extra fee for removing the contents inside your garage. If you were to use a DIY kit, keep in mind that all of the supplies necessary to perform the job may not be included. The supplies you may need may include a brush, roller, squeegee, goggles, rubber gloves, pail and/or other items. If purchasing all of these items at once, it’s best to budget at least $100 to $200. If you have an older coating, this may add another $0.80 to $2 per square foot to your quote. Borders, if you wanted to add them to your flooring, can be another 20 to 30 percent more. Custom colors, if available with some contractors, can cost more, especially if they have to special order it. Usually, there won’t be an upcharge for the materials, and the contractor, if ethical, will charge you for the shipping. Businesses and even some homeowners often want a customized logo, this can cost another $500 to $1,000, depending on the complexity and size. A one- or two-part epoxy can be a more durable than a liquid garage floor coating. Although it is safe to walk on the newly painted floor after 24 hours from completion, it is still not advisable for you to drive on the newly painted floor for about a week. You should also avoid putting heavy objects on the floor for at least a week. If you don’t mind getting your hands dirty, a DIY kit can be a great way to save hundreds, if not thousands of dollars. Most of your retailers will have kits put together that have just about everything you need to get started.